Earlier this week we introduced you to the ‘Hypnotic’ Hibiscus, a pale-pink bloom with dark maroon striped centers. 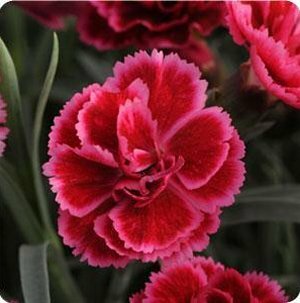 Here’s a good candidate to plant with the Hypnotic to accent the darker colors – a gorgeous Burgundy Blush. If you’re a fan of pink flowers, check out this Better Homes & Gardens article which has photos of several pink Dianthus varieties that would mix well with this pink Hibiscus, or add a touch of gorgeous color anywhere else in your landscape. If you love the look of pink flowers but aren’t sure how they might work with yourgarden plan, seek the advice of a good landscape design professional.